Ch 3 to start and join to create a ring or use a magic circle to begin. Don’t turn work until you are directed to do so on the scalloped edging. Join with slip stitch to top of Ch-2. Don’t join after last HDC. You will now begin to work in the round without joining or chaining to start a new round. Use stitch marker if desired. 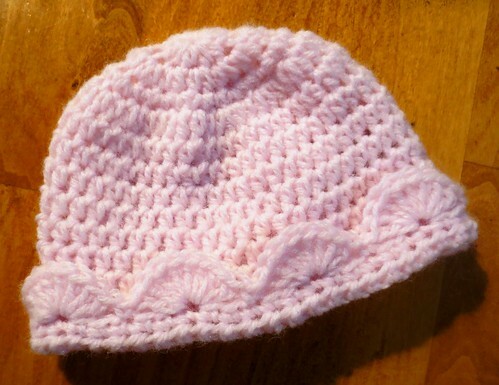 Width should be approx 3.5” wide for newborn and 3” to 3.25” wide for preemie at this point. On the final round of the hat in the last 3 stitches of the round, end with SC in last 2 stitches and slip stitch into final stitch of round. Don’t worry if edge doesn’t look exactly even as you will be folding over the scalloped edging and it hides the edge. TIP: You lose about an half inch once the scalloped edging is added and you fold over the edging. Add another round if needed at this point to get the desired hat length.